Back to Beverly Hills. After escaping the traffic, it was time for dinner. To say that we were looking forward to this meal was a major understatement. We have been a fan of Rick Bayless ever since I saw one of his cooking shows and the variety of ways he made salsas and guacamole. Bayless is the American master of Mexican cuisine. He focuses on local flavors and authenticity. Red O is at 8155 Melrose Avenue and walking in from off the street is like being transported from the busy city street to a gourmand’s playground. 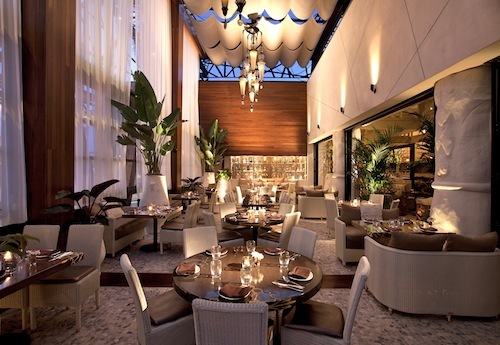 The large restaurant has high ceilings and compartmentalized spaces: a large dining room and enormous bar area with swing seats and of course required of any “hip” scene, communal tables and lounge seating. My way of verifying if I like a space is if it pulls from me the response, “this would be great for a party.” – and it would be. But, what about the food? The food is what would make me want to move to that tony little neighborhood of Beverly Hills. Mark and I started out our dinner like I wish we always could with margaritas and the Yellow fin Tuna ceviche. The fish was fresh and bright and the flavors were beautifully and boldly accented by the light sweetness of the cucumber and fullness of the avocado. The avocado addition to the ceviche was brilliant, and a delight to eat with the warm tortilla chips. To the entrees… Mark and I are big into sharing, which means that we try to always order completely different entrees. Mark ordered the Chilpachole, which on first glance looks like a bouillabaisse or cioppino dish. 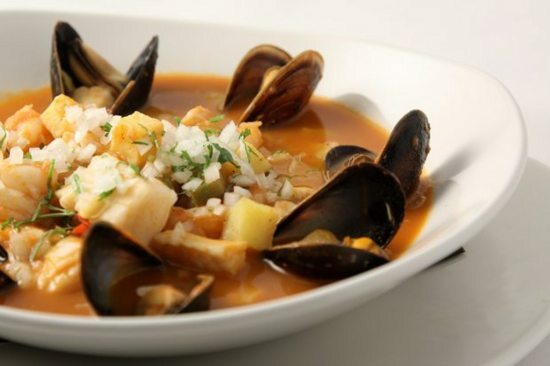 It is described as “velvety seafood broth with chipotle & epazote, Mazatlan shrimp, Viking Village scallops, Carlsbad mussels, striped bass, roasted potatoes and chayote”. If you’re like me your understanding of those ingredients might be limited to our ocean fare. Here is what I can tell you: velvety smooth is an understatement. The soup is a bowl of freshness, the flavors sing, the heat doesn’t overpower, it only emboldens the rest of the ingredients. Order, share, enjoy. I had the Camarones al Mojo de Ajo, growing up in Florida there are a few key Spanish words I recall, and yes Camarones, mojo and ajo are top of the list. What hooked me on this dish was that it included sweet plantains – what had me raving, was how it was presented. 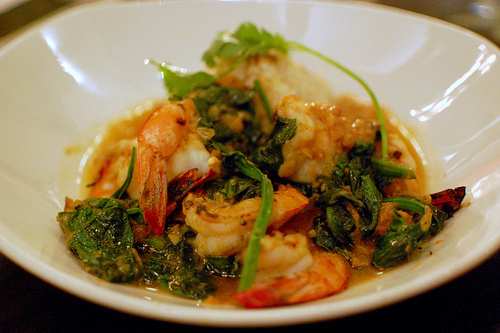 The large portion of shrimp was presented with lightly wilted Bloomsdale spinach in a fragrant and flavorful garlic sauce. The Veracruz rice and sweet plantains were served in a pyramid shape with the plantains cut into small pieces and hiding in the rice – the result equal flecks of the savory garlic and sweetness of the plantains. It was love at first bite. For dessert we shared the Veracruz-style bunuelos on the recommendation of our waitress. To be fair, we were both very full and up until this point I was keeping Kosher for Passover, but, homemade donuts and a trip to California were reason enough to break all dietary rules. They were fresh and hot from the oven, sprinkled with cinnamon and sugar and ready for dipping in the Kahlua hot chocolate sauce and salted caramel ice cream. The entire experience from first sip to last bite had us saying, Red O-M-G, muy delicioso! This entry was posted in Her Inspiration, Her Kitchen, Restaurants, travel and tagged beverly hills restaurants, hollywood restaurants, Red O Mexican Restaurant, rick bayless, Rick Bayless Mexican Restaurant, Rick Bayless Red O. Bookmark the permalink. I got hungry reading this :). A place to add to my wish list! Dead written content , Really enjoyed looking at .